RA Inflammatory Foods: What Foods Should I Avoid? For rheumatoid arthritis patients, controlling inflammation is critical in being able to live a better quality of life and improve overall health. An important way to help control inflammation is by adhering to the right diet and choosing healthy foods. Just as there are certain foods to seek out in your diet, there are also foods that should be avoided or eliminated altogether. These foods stimulate the immune system and the inflammatory process, worsening the pain, stiffness and other health complications associated with rheumatoid arthritis. In addition to medication treatment plans that include non-steroidal anti-inflammatory medications (NSAIDs) and disease-modifying antirheumatic drugs (DMARDs), limiting or eliminating altogether certain foods from your diet can help you to feel better as well. Inflammatory foods are foods that can produce or trigger inflammatory symptoms in joints and in the digestive system. These are foods that are generally processed, cooked at high temperatures, or contain lots of chemical preservatives and unnatural ingredients. Be sure to check all foods labels carefully for any of the below ingredients. Fats and oils are very common ingredients in the average North American diet. These foods are processed and chemically altered, with various ingredients added. These foods increase the body’s inflammatory response and worsening the effects of RA. Certain cooking oils like canola oil and vegetable oils are put through a process known as hydrogenation. This occurs when oils are produced by adding hydrogen atoms and effectively altering their natural state by turning them into a solid. Many hydrogenated oils also contain a natural ingredient called omega-6 fatty acids. Omega-6 fatty acids are important for a balanced diet but too much of them, and not enough omega-3 fatty acids leads to an unbalanced diet. Saturated fats are often referred to as unhealthy fats and they are found in processed meats and some dairy products. When saturated fats are digested they can trigger adipose or fat tissue inflammation. Try to replace foods that contain a lot of saturated fats with whole unprocessed foods. Another harmful ingredient found in processed foods is trans fats. Trans fats help to stimulate systemic inflammation. A diet high in trans fats can potentially worsen the symptoms of rheumatoid arthritis. Any foods that are highly processed or cooked with hydrogenated oils likely contain trans fats. Many meat products are produced by adding preservatives, artificial ingredients, hormones, and other additives. These are chemical ingredients that are foreign to the human body and can cause adverse and systemic inflammatory reactions in some people and in particular those people with RA. Avoid processed meats like deli meats, bacon, and pepperoni which have been altered and cooked with hydrogenated oils and contain saturated or trans fats. 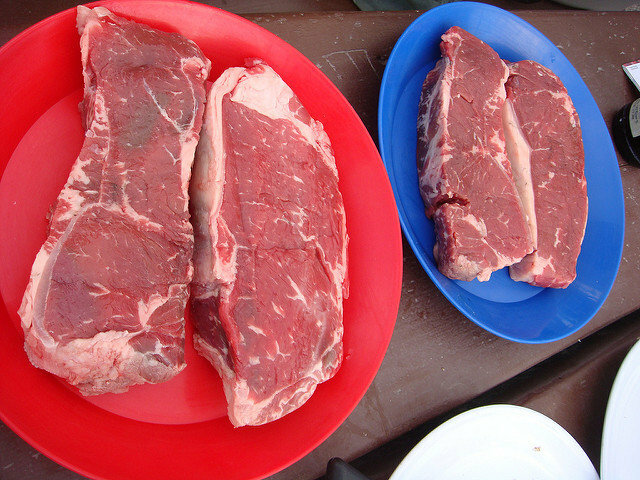 Instead, choose lean cuts of meat that are labeled organic and grass-fed as opposed to grain-fed. Try to reduce your intake of red meat by swapping it for fish instead. Many people can’t digest milk products due to an ingredient called casein. Look for products that include whey protein ingredients which often indicate the presence of casein. Milk is also used as an added ingredient in many baked goods like cookies, cake, crackers, bread and more. To keep dairy products in your diet, look for low-fat options which contain less saturated fats than whole milk products and can potentially help reduce inflammation. Sugar is an ingredient that comes in many processed forms. Sugars called fructose and glucose are refined sugar-based ingredients that can trigger inflammation when digested. Refined sugars send out inflammatory messengers in the body called cytokines. Avoid foods like white bread, French fries, and soda. Foods like white bread, white rice, pasta, and cereals are made with white flour. White flour is a refined carbohydrate that is a staple in the North American diet. It is also a leading cause of obesity and chronic disease. Refined carbohydrates like white flour also stimulate inflammatory responses and should be avoided in a rheumatoid arthritis diet. Switch to better alternatives like corn and brown rice flour. When products are advertised as sugar-free, they usually contain an artificial sweetener to improve the taste. However, artificial sweeteners use an ingredient called aspartame. Aspartame is a toxic chemical that cannot be naturally processed and thus triggers an inflammatory attack response when digested. Ingredients like wheat, barley, and rye contain a complex of proteins known as gluten which for certain people causes an allergic and inflammatory reaction when digested. Many patients with rheumatoid arthritis also develop adverse inflammatory symptoms after consuming gluten. Gluten is found in bread, pasta and many preserved or processed foods. Mono-sodium glutamate (MSG) is a flavor enhancer and preservative found in many processed foods. While there is no clear link between MSG and inflammation, it is still a chemical that isn’t naturally digested by the human body. Chemical-based foods can send certain people’s bodies into “attack” mode which is what causes inflammatory symptoms. If you’re concerned about how inflammatory foods for rheumatoid arthritis are affecting your symptoms, talk to your doctor about dietary solutions. Remember to stick to as many fruits, vegetables and whole grains as possible to help lower your inflammation levels.